Winters can be particularly rough on businesses here in central New England. Snow, ice, and freezing rain can all take a toll, making parking lots and sidewalks treacherous and discouraging customers from coming in and spending money with your company. 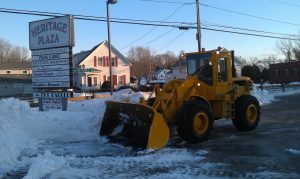 Front end loader snow removal is a key service we provide here at Mike Lynch Enterprises. In fact, we offer retail commercial, and industrial business snow removal for companies and parking lots of all shapes and sizes. Our expert snow removal services include plowing, sanding, and salting round the clock when the weather gets nasty. 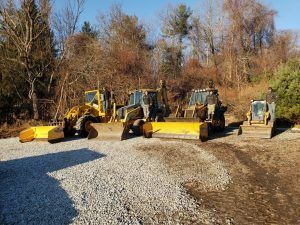 We easily handle front end loader snow removal throughout central New England with four front end loaders, on stand-by and ready roll 24/7. 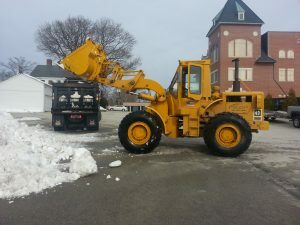 If you need front end loader snow removal to ensure your parking lot will be cleared of snow quickly and efficiently, without excuses, look to the snow removal professionals at Mike Lynch Enterprises. Contact Mike Lynch Enterprises today for all your snow removal needs.